Team at Warm Heart Foundation in Phrao, Thailand is the best! Our team is incredible, Warm Heart is truly grateful to have such talented, dedicated and caring people on our staff. 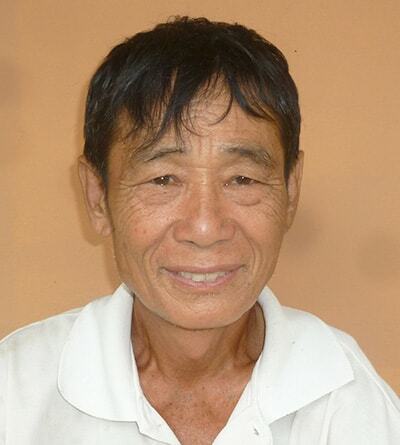 Loong Doon, (or “Uncle Doon”), came to Warm Heart in January 2010 to help build the first Clinic in the Clouds; he has never left. When we asked him to manage our farm, buildings and grounds, he just lit up, and launched into a discourse on how he wanted to improve things. Since Loong Doon took over in early 2011, there has not been a slow day. The fish ponds keep growing, our pig pens are full, and new buildings dot the landscape. And though he has everyone working all the time, his unfailing smile and patience make him immensely popular among the children who love helping him around the campus. P’Anne is the organizational heart and memory of Warm Heart, and is cash management central. She handles Warm Heart official correspondence and is the de facto secretary of the Warm Heart Foundation Board. 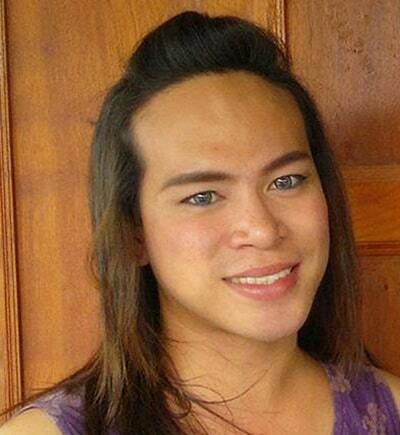 P’Anne graduated from Mae Joe University with a AA degree in Business Administration. An original member of the Warm Heart team, P’Anne has never stopped growing professionally. She has learned countless new computer skills, acquired teaching skills (in English, no less) and even learned to drive the Warm Heart car to go to Chiang Mai to meet with our accountant! 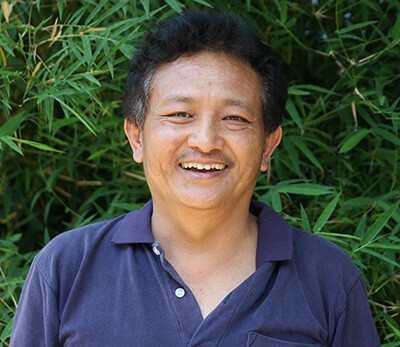 P’Jiang started working for Warm Heart in March 2012 because he loves the kids and taking the long drives up the windy mountain roads to their home villages. 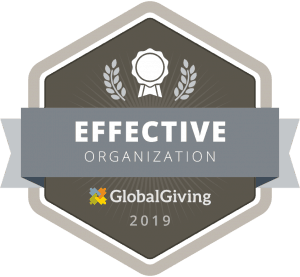 He believes in Warm Heart having watched the organization grow since the Foundation was established on part of his land five years ago. 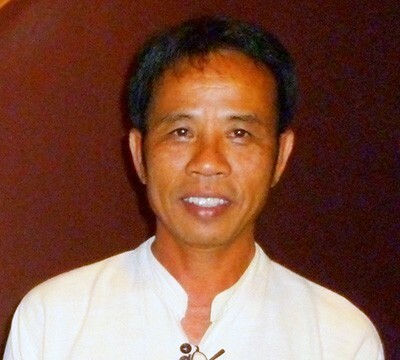 P’Jiang has worked on construction, the farm, coffee and any number of special projects. Not content just to work at Warm Heart, he spends off hours with the kids including providing his own movie night every Friday at the Children’s Home. His gentle and friendly nature is widely recognized around Phrao and in our village, and he is adored by the children. As Warm Heart’s Document Translator, Da is our Thai immigration and labor expert and handles all of our many visa and work permit applications. Da is among the brave few who joined our team at Warm Heart when it was still an idea and has grown with the organization. She spends most of her days enthroned in front of an office computer managing and translating documents, but can always be counted on to help prepare for temple visits, pack microenterprise shipments or visit kids in the hospital. Da is also a fashion designer whose designs can be appreciated in the Warm Heart Recycled collection. A real Phrao native, Da is certain that it was Karma that brought Warm Heart to town just when she was scouring Chiang Mai for a job. 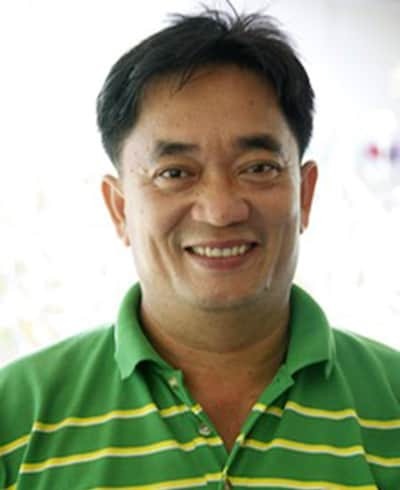 Kru Eed is Kru Noi’s husband and didn’t really join Warm Heart at all; he was joined to Warm Heart in 2014 to teach Thai and math driving Kru Noi to teach the kids 6 days a week for more than a year! Inspired by her passion and enthusiasm to teach and seeing how much the children enjoyed being with her, Kru Eed decided to teach alongside her. Kru Eed really enjoys being with kids and it’s evident that the children adore him as well as they huddle around him reciting their Thai vowels and consonants at the top of their lungs. How he manages is something of a miracle, as the little boys’ idea of studying with him includes sitting on him and on the table in front of him. He is infinitely patient, however, and is a large part of the reason that our kids are such stars in math at school. She was so interested that she paid us a visit. What she found impressed her. It was both the work that Warm Heart is doing and the “family feel” of the organization that enticed her to stick around. She now spends weekday afternoons and Saturday mornings teaching Warm Heart’s littlest Thai and math. These 6 and 7 year-olds come to us barely speaking a word of Thai, but within weeks we hear them shouting their complex Thai consonant-vowel combinations in unison and know that the tiny Kru Noi is in front leading. P’Aor began by handling Warm Heart’s daily paper flow. The endless stream of unit reports, budgets, spending requests and receipts all landed on her desk to be sorted, recorded, summarized, passed on and filed. It was soon clear that she was destined for higher things. P’Aor was forced to drop out of university because of family problems, but had the get up and go to start her own business and find a job at 7-11 before applying to Warm Heart. We love that kind of spirit and the fact that she values community over the certainty of a corporate job. Today P’Aor handles the books at the Children’s Homes, and manages the business end of our chickens, cows, ducks, fish and pigs. 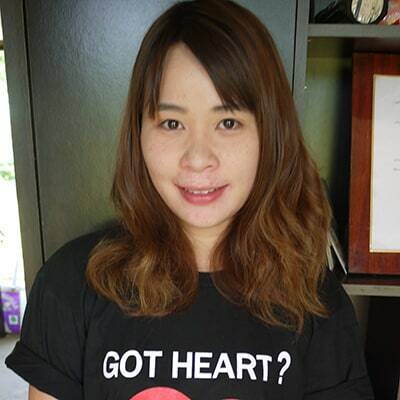 Originally from Lan Pang, Nian joined our team at Warm Heart in 2012 after hearing about us through her friend P’Dao, a local Warm Heart volunteer. Bi-lingual in Thai and English, Nian oversaw the development of the Eri silk microenterprise business. After a year at Warm Heart, she joined an American Warm Heart volunteer to start Thai-High Coffee, a coffee processing company, in Phrao. 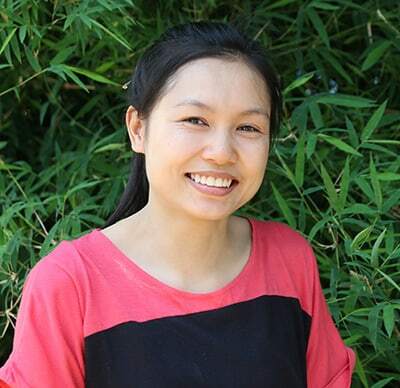 After two years in the business world, Nian realized she wanted to do something more meaningful with her career and re-joined the Warm Heart team in 2015 as Operations and HR Manager. 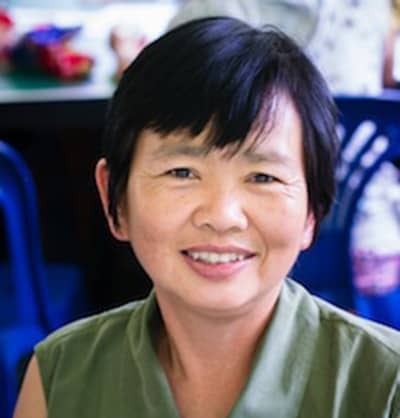 As Evelind’s right hand woman, Nian plays the critical role of translator amongst the volunteers, the staff and the community as well as the being the ears and voice of the community. P’Tai is super-mom. Her own two boys are always first in their class, so we passed on to her the task of managing our older boys’ annex. Every afternoon and many Saturdays and Sundays, P’Tai visits the elderly and disabled in Maewan, bringing her big laugh, mops and pots – and running people to the clinic whenever necessary. 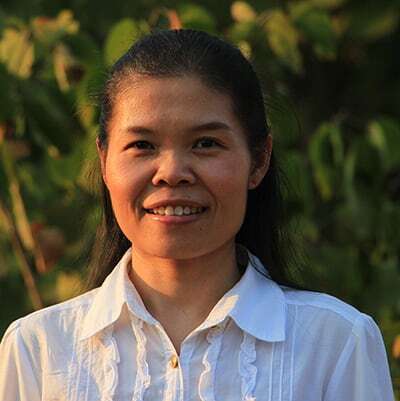 We have known P’Tai since 2008 and in 2009 she was our first microloan recipient. She joined Warm Heart officially in 2013 as Cook, Logistics Coordinator and Matron and last year established the Annex. She expanded her small restaurant across the street from our original offices and is renowned for her delicious Khao Soi. Judging by the crowds, all of Phrao seems to agree. Prachan “PJ” Jakeo has been with our team since 2009 when he joined as a translator for our strategic partners Engineers Without Borders. 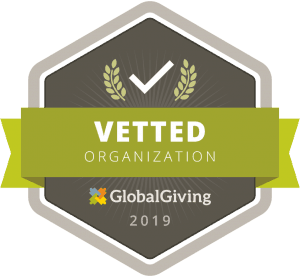 We quickly realized that his twenty years in the US Air Force and commitment to doing something to improve the quality of life in Phrao, his home town, made him invaluable to Warm Heart. Today PJ manages our team and all of Warm Heart’s relations with national, provincial, district, sub-district and village leaders, organizes all projects in the field and is often found up to his knees in mud actually building projects. He is available 7 days a week whenever need arises, including at 3:00 AM when one of our disabled needs an emergency ride to the hospital in Chiang Mai! 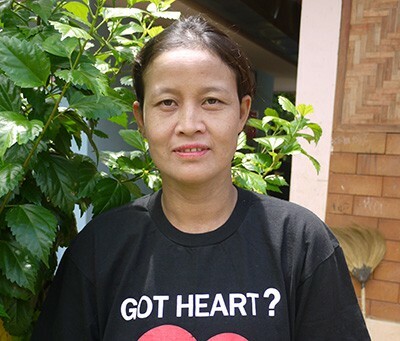 Pranee previously worked at the Phrao market and joined Warm Heart in 2014 to change careers. She assists the Senior House Mother with cooking, making sure the kids do their chores and enjoys watching TV with the kids. As a native of Maesoon, Pranee speaks Karen which helps to communicate with the children and put them at ease as they learn to master the Thai language. Kru Boi showed up with Kru Noi in tow on her first day. Since they work at the same cooperative she was originally just a chauffer as Kru Noi does not drive, but she too liked what she saw. The Foundation and the students were friendly and welcoming. 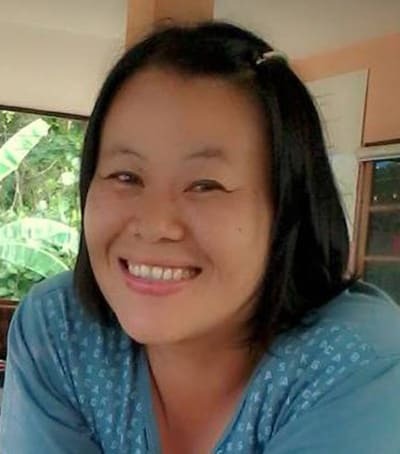 Since then she has joined our team with Kru Noi and can be found rounding up the kids from the kitchen of the Children’s Homes, spurring them to finish their homework and teaching them Thai. They complain loudly, but she is firm with a smile, and besides, they all like playing with her delightful little daughter who thinks that she is the queen of Warm Heart. SriPan arrived with the first five Warm Heart Children and is the smile of the Children’s Homes. Na’Paan (big auntie Paan) manages the children (when they are not actually hanging on her), cooks, cleans, does laundry for the little ones, and when she can’t find anything else to do, helps on the farm. Na’Paan is from Mae Soon, the village from which eight of our kids come, and provides a direct link to parents and culture. 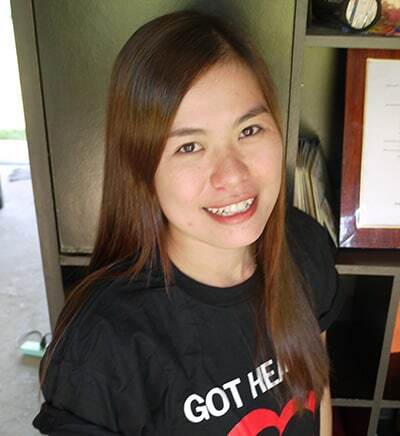 She has been on our team at Warm Heart since May 2009 and hopes to dedicate her life towards helping children. She is also a skilled weaver and teaches our girls and local village women the traditional art of “backstrap” weaving.